This product has been replaced by the Dual 3/5/8 Amp AutoReversing DCC Booster (DB220) and is no longer available. 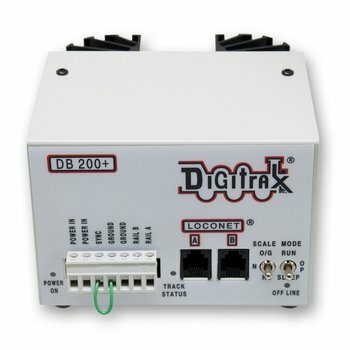 Click here to view the DB220. DB200 Plus 8 Amp Booster gives you 8 amps of power to run more trains, manage short circuit shutdowns and add automatic reversing. Great for adding more power to layouts running many locos or large-scale locos. DB200 Plus 8 Amp Booster is a booster only, it must be used in conjunction with a command station to work.